Eun sang’s friend drops by the cafe where she works. He’s Yoon chan young, a platonic childhood buddy. His girl friend Lee bo na joins them. 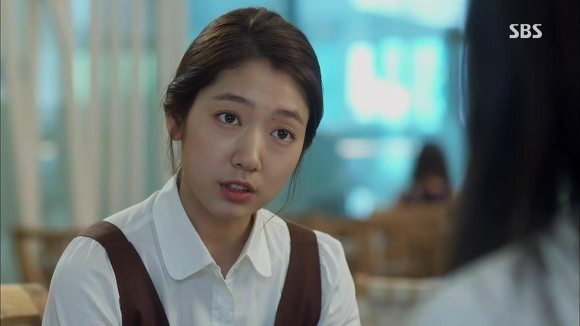 She tells Eun sang to stop flirting with her boy friend. Are you going to order or leave? 이보나: 대박, 손님한테 이래도 돼? 서비스 완전 엉망이네. Wow, are you allowed to do this to customers? Talk about service! Talk about luck! 정말 운이 좋군!/ Talk about a jerk! 그런 바보도 없다니까! Talk about a bad day! 오늘 진짜 재수 옴 붙었다! 차은상: 이런 들켰네. Oh no, you got me. 이보나: 찬영아 가자. 너 내일 떠나는데 얘랑 이러는 거 시간 너무 아까워. Chan young, let’s go! You’re leaving tomorrow. I don’t want to waste any more time with her. 차은상: 너 어디가? Are you going somewhere? 이보나: 말해 주지마! Don’t tell her! 나만 알 거야. It’s just between you and me. 근데 너 내가 화이트 베이직에 레드로 포인트 주리고 했잖아. when you wear white as a base color. It’s called the Summer Jingle Bell concept. 윤찬영: 이거 레드. These are red. 이보나: 이건 래드가 아니라 다크레드지. That’s not red. That’s dark red. 못 살아! 가자. Gosh! Let’s go. 윤찬영: 미안하다 시간 뺏어서. I’m sorry for taking your time. 이보나: 손님도 없는데 무슨. There’s no customer anyway. 윤찬영: 문자하자. I will text you. 이보나: 하기만 해! Don’t you dare! 차은상: 저 사치 덩어리들. They are so full of luxury. 이보나: 구질구질 주제에 나 무시하고 내 앞에서 기도 안 죽고. She is poor and she looks down on me. She never loses her nerve in front of me. 내가 모르는 윤찬영 어린 시절 다 알고 있고. 짜증나! She knows about your childhood which I don’t even know. It’s so annoying! 윤찬영: 은상이랑 나랑은 그냥 친구야. 네 인생의 반은 친구로 지냈다. She and I are just friends. We have been friends for half of my life. 이보나: 친구 가능한 남녀 청소년이 세상에 어딨어! There’s no such thing. Guys and girls can never be just friends!